Location. 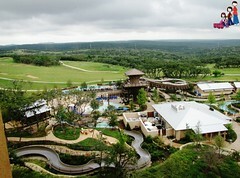 JW Marriott San Antonio Hill Country Resort & Spa is located in San Antonio and local attractions include Canyon Springs Golf Club and Natural Bridge Wildlife Ranch. Hotel Features. In addition to 7 restaurants, JW Marriott San Antonio Hill Country Resort & Spa offers a snack bar/deli and a coffee shop/cafe. A poolside bar and a bar/lounge are open for drinks. Room service is available 24 hours a day. Recreational amenities include a waterpark with a lazy river and a waterslide, as well as 5 outdoor swimming pools. Also located on site are a health club, a golf course, a spa tub, and a children's club. The property's full-service health spa has body treatments, massage/treatment rooms, and facials. This 4.5-star property has a 24-hour business center and offers small meeting rooms, secretarial services, and a technology helpdesk. Wireless and wired high-speed Internet access is available in public areas (surcharges apply). This San Antonio property has 265000 square feet of event space consisting of a conference center, banquet facilities, conference/meeting rooms, and a ballroom. Business services, wedding services, limo/town car service, and tour/ticket assistance are available. Guest parking is complimentary. 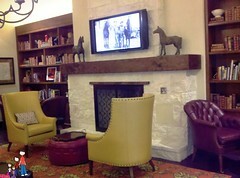 Additional property amenities include a library, valet parking, and a concierge desk. This is a smoke-free property. Guestrooms. There are 1002 guestrooms at JW Marriott San Antonio Hill Country Resort & Spa. Beds come with pillowtop mattresses and signature bedding. Refrigerators and coffee/tea makers are offered. Bathrooms feature separate bathtubs and showers, bathrobes, slippers, and hair dryers. Wired high-speed and wireless Internet access is available for a surcharge. In addition to desks and in-room safes, guestrooms offer cordless phones with voice mail. 37-inch LCD televisions have cable channels. Air-conditioned rooms also include iPod docking stations, separate sitting areas, complimentary bottled water, and irons/ironing boards. A nightly turndown service is offered. Cribs (infant beds) and rollaway beds are available on request. Guestrooms are all non-smoking. Notifications and Fees: The following mandatory hotel-imposed fees are charged and collected by the hotel either at check-in or check-out. Resort fee: USD 25 per room, per day Hotel resort fee inclusions: Use of fitness center Use of sporting facilities or equipment Internet access Phone calls Additional inclusions The above list may not be comprehensive. Mandatory hotel-imposed fees may not include tax and are subject to change. The following fees and deposits are charged by the property at time of service, check-in, or check-out. Valet parking: USD 25 per day Fee for in-room high-speed Internet (wired): USD 14.95 per day (rates may vary) Fee for in-room wireless Internet: USD 14.95 per day (rates may vary) The above list may not be comprehensive. Fees and deposits may not include tax and are subject to change. You must present a photo ID when checking in. Your credit card is charged at the time you book. Bed type and smoking preferences are not guaranteed. Your reservation is prepaid and is guaranteed for late arrival. The total charge includes all room charges and taxes, as well as fees for access and booking. Any incidental charges such as parking, phone calls, and room service will be handled directly between you and the property. This resort would appeal to a variety of types of families. We enjoyed the resort with three generations and there was definitely something for everyone! Sporty families would like all the activities from the water park to the golf facilities (jr. academy for kids!) to the tennis courts and jogging/biking/hiking trails. Active families would find that there are a number of options to choose from the sporty ones mentioned above to painting classes and interactive games located throughout the resort. Families can take advantage of lots of opportunities to learn about local and regional history, animal watching adventures, and seminars in the Library. Laid back families can hang by the pool all day, enjoying badminton on the lawn, barefoot dining at the outdoor restaurant, smores at the outdoor firepit, etc. This a very grand style hotel with a simple quiet elegance. The staff is incredibly courteous, southern manners and all. We spent most of our time at the resort at the pool which had really fun water slides, a lazy river, and a yummy cafe. During peak times at the resort there are float n' flick nights which are fun for the whole family. My youngest enjoyed the Texas-themed kids program a lot, learning about Texas history and Mexican culture all through games, art projects, a fun activities like calf-roping. The resort lacks some appeal to young teens wanting more to do after a day in the sun and on the slides. I tried to get my 14 yr old a nail appt at the spa but you have to be 16. There are seasonal Teen Nights where teens gather on the tennis courts for some line dancing and bbq. I suggested to them that they have a tennis academy for teens like they have for golf and they seemed to love that idea! In all though, my teen was never bored. She loved the walking trails and seeing the bird sanctuary and felt like it was still fun for her age, just with less organized activities. Most teens hung at the slides or the game boards. I highly recommend a day at the spa for mom when on a family vacation! This is one of the best I have ever experienced. I had the Restorative Organic Massage. 50 minutes, $135. It was incredible. It utilizes oils and waters from the area, specifically lavender, juniper and lime. Most 50 minute massages are $135; 80 minute ones $180-190. The spa itself is beautiful and relaxing. They have incorporated many Native American rituals from the area and blended them with an upscale spa experience. I particularly enjoyed spending a little time in the Meditation Room after my massage. The Curandero rituals that were part of my massage left me in a very spiritual mood and it was so lovely to have a space to go to, complete with a breathing treatment, to sit with my feelings. It was magical. All in all, this was one of the most relaxing vacations my family has ever enjoyed. There are several pools: 2 children’s pools with water activities and small slides, a few pools with a maximum depth of about 4 ft which are fun for older children, a serene adult infinity pool, hot and cold plunge pools and one at the spa. The main event is the water park at the main pools which feature a rapid river ride, three water slides and a half mile long lazy river. The pools are heated for year-round enjoyment. A nice feature is that you can be in the adult pool and see your kids going down the water slides. The separate pool area for little kids is a dream! With multiple life guards (I counted 3), kids can splash around on a kushy-floored surface with fountains, sprayers and water toys all over. There are small slides (4 ft. and 6 ft. high), animal sculptures in the water to sit on and climb over, and fun music playing. This area is safely situated in the middle of the larger pool area. The main pools all connect by paths and bridges. The deepest is 4 ft and all are visible from the center deck area. Families can centrally locate themselves and easily access the pools, the river, the slides and the restaurant. Lifeguards are positioned all around the area, including in various locations around the lazy river. The lazy river is a 12oo foot loop around the pools. Single and double tubes are available for free. Several moms carried toddlers easily as they drifted around the river. The Water Tower slides (2) have a starting platform 35 feet high and with a 275 feet long ride through enclosed tubes, you’ll scream with delight and just a bit of anxiety in a single or double raft with twists and turns that drop you into an exit pool at the end. Fun times being “rescued” out of the center of the tube by the supernice lifeguard! There is also a Pedernales River ride which shoots you along fast and furious over 350 feet of “rapids” where younger guests at the kiddie area can spray rafters and “detonate” water bombs from above. It’s a curvy, wild ride to be done either solo or in a double raft. We found the arcade to be the most disappointing part of the resort. BORING! Out of a dozen arcade games only a few didn’t involve shooting something or blowing something up: a motorcycle game, a pacman like game, and a crane grabbing a prize game (the kind that never produce a win!). All faced a wall in a dark, small room. It was empty every time we poked our heads in and my teen wanted nothing to do with it. MUCH more appealing were the interactive game boards in the lobby of the resort that were free of charge for games (like Pong, backgammon, solitaire, etc.). Guests could also use these stations to create scrapbooks of their resort experiences, uploading photos and getting creative with the scrapbook program. For a nominal fee the resort would print them up or you could upload them to your own email and print them from home. The Range Riders Kid Camp (ages 4-12) is a wonderful, very flexible program. Reservations are requested but drop ins are accepted based on availability. Hours change seasonally, so check when make reservations. Fees are $10 per hour, with a discount for multiple children. Have your insurance card with you. There are 7 restaurants at the resort which are so varied that we were always able to find something good for even our pickiest eater! Cibolo Moon was our favorite restaurant. The variety was amazing. For each meal we all wanted to try something different. Even my picky eaters were inspired to try some new Texan sensation. They delighted in the different dipping sauces, the Southern flare to everything, and the easy-going staff. My husband enjoyed things he doesn’t usually eat like Bison and succotash. And my hardest to please kid LOVED the “burnt ends” and flour tortillas. She even wanted them for breakfast. Possibly the best family resort we have visited. The kids club is incredible- the girls wanted to spend more time there than with us! A fabulous pool area with 3 pools, waterslides and outdoor dining. Comfortable rooms in Texas inspired design. 2 PGA golf courses on property, as well as a terrific steak house and fabulous spa. This resort has everything! If it weren't so close to San Antonio you wouldn't want to leave!